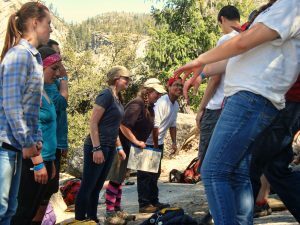 NatureBridge in Yosemite is a five-day outdoor environmental education program that The McConnell Foundation offers to North State students. NatureBridge is a nonprofit organization that has provided environmental education in partnership with the National Park Service since 1971. In addition to Yosemite, NatureBridge offers programs in Olympic Park, Washington; Headlands Institute at Marin Headlands in the Bay Area; and Santa Monica Mountains Institute in Southern California. In 1989, The McConnell Foundation began funding theYosemite Program for students in the North State. 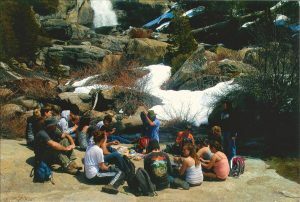 Each spring, high school sophomores and juniors from public high schools and public charter schools in Modoc, Shasta, Siskiyou, Tehama and Trinity counties, and Big Valley High School in Lassen County spend a transformative week in Yosemite. Groups of students, led by NatureBridge field instructors, explore the park and participate in discussions and activities designed to heighten awareness of the importance of our natural world. Keeping this goal in mind, curriculum taught during the week aligns with state and federal standards. The Foundation provides full funding for student tuition, transportation, and administration. Adult chaperones from the schools served accompany students on the trip. Students who participate in the program are selected by Yosemite Advisors at each high school. Once selected, participants must complete 8 hours of community service related to the environment in order to secure their spot. In past years students have volunteered at organizations such as the Shasta County Wildlife Refuge, Whiskeytown Environmental School, the Upper Sacramento River Exchange, Turtle Bay Exploration Park, and the Department of Fish & Game. They have also cleaned up roadways and started recycling programs in their schools. The goal of the community service requirement is to connect students their community and the earth. The goal of the program is to inspire students to develop a connection to the natural world and empower them to act as responsible stewards of natural resources. The 2019 Yosemite Program is scheduled for Sunday, April 7 through Friday, April 12, 2019. This year 80 students and 16 adults from North State high schools will be participating in the program. For changes or information before the trip, contact Ana Bachman, Program Coordinator, at 530-226-6235; during the trip, text or call Lead Chaperone Dan Voorhees at 530-209-0683. Keep in mind that cell service is sketchy in the Yosemite Valley. For more information about the Yosemite Program visit NatureBridge.org or contact Program Coordinator Ana Bachman at ana@mcconnellfoundation.org.